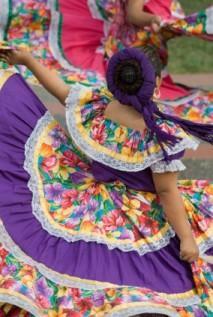 Mexican dance costumes vary widely from region to region and dance to dance. The main thing they all have in common is that they are very beautiful and enhance the performance of the dance. Despite the wide variations in traditional dances, most of the costumes have the influence of the Spanish conquistadors. Folkorico, the name used to designate a traditional dance, demands costumes of intricate design that allow the performers a full range of motion. The dresses worn by women have very long, full skirts. They are often held up to create a picture and the dresses become as much a part of the performance as the dancers themselves. The skirts are long, ruffled and tiered. They are either in a bright color or white, but either way, they are trimmed with colorful ribbons and lace. It is very common to see red and green ribbons in the colors of the Mexican flag. Tops tend to be off the shoulder and ruffled, as a regular peasant blouse, and usually trimmed in the same color ribbon. Men most commonly wear a mariachi costume, which consists of slim black trousers, usually decorated down the sides of each leg and an elaborately decorated jacket, finished with a string tie and oversized hat. This is the most famous dance in Mexico and is even called the National Folk Dance. The standard costumes were actually designed about one hundred years apart from one another. Women wear the China Poblana, a servant outfit seen in the mid-19th century. It is comparatively short, showing off the ankles and generally consists of a short-sleeved white blouse, sometimes decorated with embroidery or a light floral print and a brightly colored, shiny skirt worn over white petticoats.The skirt is often decorated with sequins to further show off its Chinese style. It is said that the outfit came about because of a Chinese princess sold into slavery in Mexico, but in fact goods from China came to the country every few months via the Philippines and the Spanish aristocrats made their servants clothing from the fabric that was not long enough to reach the floor. In those days, more silk was added at the top, so that the skirts today always have two fabrics. Men wear a charro suit, which is essentially the mariachi costume. This was first seen in the 1930s and was worn by city musicians. For performance, it includes silver buttons and instead of a bolero tie, a man might wear a large red bow tie with the ends hanging down his chest. For women, this is the most popular Mexican dance costume outside of Mexico and is instantly recognizable. The dresses feature enormous skirts and are usually in a vivid color such as bright pink and decorated with multi-colored ribbons. The neck is covered and sleeves are either full length or to the elbow. The fitted bodice is decorated with more ribbons and lace. Matching ribbons are usually worn in the hair. Authentic Mexican dance costumes tend to be expensive, as there is a lot of fabric and intricate design work. However, if you are part of a performance troupe, it is to be expected and the costume will last a long time with proper care. While it's best to go somewhere you can try the costume on and adjust for fit and performance need, a good online source is El Charro. They manufacture both shoes and dance costumes and sell both wholesale and retail in Mexico and the US. While many costume shops offer what they call traditional costume, it is best to buy from an actual designer, so that you know you are getting the real thing at the best quality. Mexican dance costumes are not the kind of costume you can skimp on and get away with it. These dances are part of the Mexican heritage, so it's important to honor that and either buy or make individual pieces that look as authentic as possible. If you can do that, you can wear your costume with pride.